Jesus has “all authority in heaven and on earth” (Matthew 28:18). Thus, there is no authority left for us to have. We are merely Christ’s mighty men; see 2 Samuel 23:8-39. We have no authority except our King’s and we are only acting in His authority when we are carrying out or handing down His orders. Spiritual authority is not a matter of one’s position or person; see Galatians 2:6, 9. It is not possessed because of who we are or the position we hold. Instead, spiritual authority comes exclusively from obedience to Christ. According to Philippians 2:5-11, God “exalted” Jesus and “gave him a name which is above every name,” because Jesus “humbled himself, and became obedient unto death, even the death of the cross.” Christ has been given all authority in heaven and on earth because of His obedience to the Father. Likewise, Christians are given Christ’s authority only when we are obedient to Him. In Matthew 8:5-13, our Lord encounters a Roman Centurion. The Centurion’s understanding of authority results in Christ commending him for his faith. The Centurion understood that as long as he submitted to those in authority over him he could exercise authority over those under him. However, the moment he stepped out from under the authority of those over him he lost all authority over those under him. The authority of spiritual leaders comes from their submission to Christ—the spiritual authority over them. Our spiritual leaders are to be submitted to as long as they are submitting to Christ. However, the moment they step out from under Christ’s authority they lose all of their authority. No Christian should ever follow any spiritual leader who is not following Christ, regardless of the spiritual leader’s position and prominence. This explains why Hebrews 13:7 identifies spiritual leaders as those “who speak the word of God” and have a faith worth imitating. Only those who say and do what God says have the authority to lead. According to Jesus, He alone is our “Master” or spiritual authority; see verse 10. We are never to hand over the final say so in our spiritual lives to anyone but Christ! As Baptists we have always championed this great truth. This is why the 1963 edition of The Baptist Faith And Message boldly proclaimed, “The sole authority for faith and practice among Baptists is Jesus Christ whose will is revealed in the Holy Scriptures.” Unfortunately, this important statement from our 1963 confession has been suspiciously deleted from the revised Baptist Faith And Message. Jesus taught that our spiritual welfare is far too important to be trusted with “any father upon earth.” Therefore, we must not trust manmade creeds to tell us what to believe nor religious leaders to tell us what to practice. Indeed, we dare not trust anyone with our spiritual wellbeing except our “Father which is in heaven.” He alone is to be our final spiritual authority in matters of faith and practice. In John 13:3-17, Jesus sets the perfect example for spiritual leaders by washing His disciples’ feet; see verse 15. Interestingly, John begins his account of this incredible act of humility with the statement, “Jesus knew that the Father had put all things under his power, and that he had come from God and was returning to God.” In spite of His power and position, Jesus took the place of a servant, even submitting Himself to the humiliation of washing His disciples’ feet. How unlike the religious leaders of His Day who insisted upon others serving and submitting to them. According to Philippians 2:5, “our attitude should be the same as that of Christ Jesus.” Like Christ, we should be willing to humble ourselves and become a servant to others. If we will—in obedience to Christ—Christ will exalt us and give us His authority, just as His Father exalted Him and gave Him all authority in heaven and on earth. In Christ’s denunciation of the Scribes and Pharisees, He teaches that the “greatest among us shall be our servant” and “that whosoever shall exalt himself shall be abased; and he that shall humble himself shall be exalted” (Matthew 23:11-12). The Scribes and Pharisees peered down their noses from their exalted positions at the common people. They insisted that they be served and submitted to by the populace. Consequently, Jesus prohibited the people from conferring on their religious leaders the titles they coveted; namely,“Rabbi” [Teacher] and “Master” [Lord]. Unlike the Scribes and Pharisees, Jesus, in spite of His exalted position, humbled Himself and served the common man. He even stooped so low as to become “a friend of sinners” (Matthew 11:19). 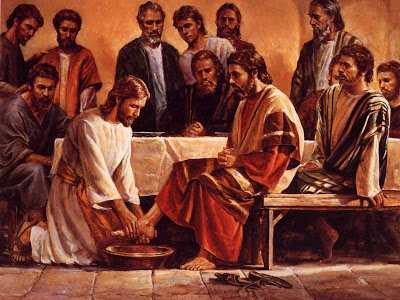 Yet, Christ said to His disciples after washing their feet, “You call me ‘Teacher’ and ‘Lord,’ and rightly so, for that is what I am” (John 13:13). True spiritual authority is always girded in humility and worn by a servant. You will always find it kneeling at your feet. On the other hand, you should never call anyone a spiritual authority who insist upon your kneeling at their feet. The Apostle Peter charged church leaders “not to lord it over those entrusted to them,” but to “be an example to the flock” (1 Peter 5:3). Spiritual leaders are to be like Jesus. They are to humbly lead by their examples of service. They are not to be like the Pharisees, lording it over the people in all matters of faith and practice. I believe a word of warning is warranted to all who will espouse the scriptural truth of spiritual authority. Authoritarians won’t like it! Remember, the Scribes and Pharisees decided, because of the threat that Jesus posed to their position, that it was better for Jesus to lose His life than for them to lose their place (John 11:47-53). Any Christian who decides to follow the example of Christ will be no less of a threat to today’s religious leaders than Jesus was to Israel’s. Thus, we should expect no less opposition. Today’s Pharisees, just like yesterday’s, won’t hesitate to take our lives to save their place. The true spiritual leader is never jealous of God’s anointing of others. Indeed, he wants all of God’s people to be used by God as he is! Whoever God uses is immaterial to him. What matters is what the Lord does through whomever. The focus of the true spiritual leader is always on God’s work, never on the human instrument God uses. Tragically; jealousy, personal ambition and a spirit of competition are not uncommon characteristics among today’s spiritual leaders. Unlike Moses, they fear someone else’s ministry outshining their own. When will they ever learn that it is Jesus’ ministry and not theirs? Their ministries are only relevant to the degree that Christ is using them to perform His ministry in our world today. In the Old Testament, Israel had a High Priest around whose ministry everything revolved. In order to perform his ministry, the High Priest used certain choice vessels. Some of the vessels were used to perform the most noble tasks. Others were used to perform the most menial tasks. Still, all the vessels were of equal importance. The High Priest could not perform his ministry without them all. In the New Testament, we have a “great priest over the house of God”—Jesus Christ (Hebrews 10:19-22). Everything today revolves around Jesus’ ministry. Our High Priest, just like Israel’s, has “chosen vessels” with which to perform His ministry (Acts 9:15). These choice vessels—you and I—have been “sprinkled with blood”; see Hebrews 9:21. Some of us have been chosen for “noble purposes” and some of us “for common use” (Romans 9:21). Still, all of us are of equal importance. Christ cannot perform His ministry without us all. When we start comparing Christ’s use of us with His use of others we “are not wise” (2 Corinthians 10:12). In fact, Paul says doing such a thing is worldly, foolish and insane; see 2 Corinthians 11:18-23. The vessel Christ chooses to work through is inconsequential. All that matters is that Christ’s ministry is being performed. In this we should all rejoice, regardless of who Christ is ministering through. In Ephesians 4:11, Paul writes, “It was he [Jesus] who gave some to be apostles, some to be prophets, some to be evangelists, and some to be pastors and teachers.” Is it possible, in view of Paul’s words in Ephesians 4:7—“But to each one of us grace has been given as Christ apportioned it”— that God includes “each one of us” in church leadership? In other words, some Christians are apostles, some are prophets, some are evangelists, some are pastors, and some are teachers, but all Christians are one or the other. Granted, this doesn’t mean that each one of us is called to preach from the pulpit of our local church. It only means that God speaks through every Christian from time to time. And when God speaks through the gal on the back pew should we pay any less attention than when He speaks through the guy in the pulpit? Maybe the day Moses hoped for has arrived, the day when all God’s people are prophets! Whether all Christians are leaders in the church may be debatable, but the fact that all Christians are ministers is indisputable. As recipients of spiritual gifts all Christians have the responsibility of ministry; see Romans 12:3-8; 1 Corinthians 12:7-12, 27-31, Ephesians 4:7-12. All Christians are responsible for the discovery, development, and deployment of their spiritual gifts in the body of Christ. The tragedy of today’s church is that ministry has been relegated to the chosen few. Perhaps, nothing has proven more detrimental to the church than its fracture during the Dark Ages into clergy and laity. This division of the church into those who minister and those who don’t is totally unscriptural. In fact, the term “layman” literally means “not priestly.” Such a title is utterly unfitting for any member of the “holy” and “royal priesthood”; see 1 Peter 2:5, 9. All Christians are clergy; that is, priests unto God and ministers of Jesus Christ. While God occasionally uses the select among us—"the wise, mighty, and noble"—He normally uses the rest of us—"the foolish, weak, lowly, and despised"—see 1 Corinthians 1:26-31. Therefore, if we believe God only uses those who are “somebody” and never those who are“nobodies,” we are going to miss out on most of what God does! In Ephesians 5:21, Paul admonishes us “to submit to one another out of reverence for Christ.” Notice, our mutual submission is “out of reverence for Christ.” It is not out of reverence for mega-church pastors, denominational leaders, or famous evangelists. In other words, we are to submit to our fellow-believers whenever Christ is using them to lead, minister or speak to us. Likewise, our fellow-believers are to submit to us whenever Christ is using us to lead, minister or speak to them. Three years after his conversion, the Apostle Paul went up to Jerusalem to see Peter. Fourteen years later, he returned to Jerusalem because of a controversy in the church between the Jews—to whom Peter was sent—and the Gentiles—to whom he was sent. When the Council at Jerusalem, which was under the leadership of James, Peter and John, settled the dispute, Paul submitted himself to their requests. Shortly thereafter, Peter paid Paul a visit in Antioch. At first, Peter enjoyed fellowshipping with the Gentile Christians in Antioch. Then some Jews arrived from Jerusalem. Immediately, for fear of the Jews, Peter broke off all fellowship with his Gentile brothers and sisters in Christ. For this “wrong” Paul “opposed Peter to his face” (Galatians 2:11). How do you explain Paul in Peter’s face? How could Paul publicly rebuke this pillar of the church whose acquaintance he had sought out after his conversion? How could he oppose in Antioch the very one whose leadership he had submitted to in Jerusalem? The answer is quite simple. When Peter was doing what Jesus wanted, Paul gladly submitted, but when Peter wasn’t doing what Jesus wanted, Paul resisted. The Apostle Paul understood, as we all should, that “God accepteth no man’s person” (Galatians 2:6). Therefore, Paul was not impressed nor intimidated by those reputed to be “somebody”; see Galatians 2:9. He wasn’t about to live his life to please men, no matter who they were. Paul only wanted to please Christ (Galatians 1:10). Thus, when Christ led, ministered, or spoke through Peter, Paul was more than happy to submit to Peter “out of reverence for Christ.” However, when Christ was not leading, ministering or speaking through Peter, Paul was not about to submit out of reverence for Peter, regardless of who Peter was and what position he held. Mutual submission means we listen to the word Christ speaks through our fellow-believers, regardless of who they are. It means we receive the ministry Christ performs through our fellow-believers, whether they are “somebodies” or “nobodies.” It means we follow Christ even when He chooses to lead through the gal on the back pew instead of through the guy in the pulpit. You have the author's permission to print and freely distribute to others this entire manuscript or any portion thereof. If you would like to help us continue to offer complimentary resources, like Spiritual Authority, you can make a tax-deductible donation to "Time For Truth Ministries." All contributions should be mailed to: Time For Truth, P. O. Box 811, Townsend, TN 37882.